I can't tell you how excited I was to post this recipe and video! 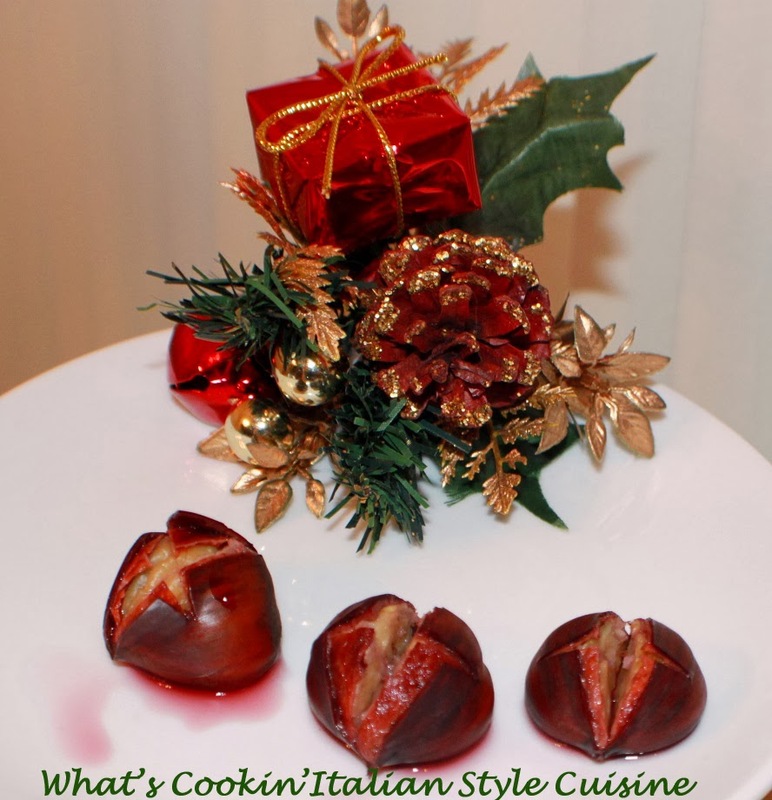 I really loved the flavor in these chestnuts. I picked up these chestnuts from our local grocer today and they really are hard to find even during the Holiday. You can use any flavor red wine you like although I don't prefer the sweet on these but you can decide. I think both recipes I am sharing on here you will enjoy. The chestnuts leftover if any can be used in any stuffing recipe you like. Hope you enjoy them as much as I did! Just remember to cook them until tender. It depends on time and size. Buon Appetito! Wash then soak the chestnuts in hot water for around 10 minutes to clean. Place them in a heavy skillet single and a pan that has a cover to fit. Pour in a cup of water in the pan, cover the pan, place the heat up to high and cook for approximately 5 minutes or more, stir them with a wooden spoon until the skins start to open. Continue to add more water and steam on medium heat until the meat is soft when pierced with a fork. 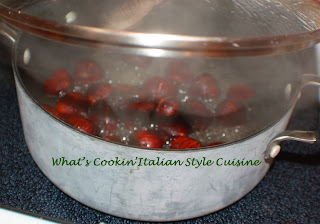 Keep steaming until they are tender then lower the heat to a very low heat to roast the chestnuts in the same pan (this now will have created a dry pan), make sure the cover is still on, continue roasting for 15 to 20 minutes until the shells are roasted. Stir every few minutes so not to burn, keep turning them. When the shells are toasted and the nut meats are tender, turn off the heat. 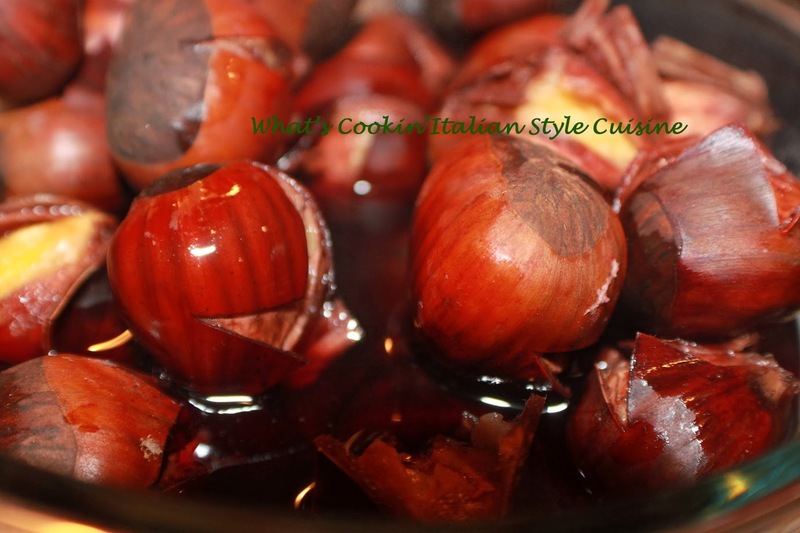 In a large bowl or baking dish pour the wine over the hot chestnuts until saturated. Let the chestnuts rest to absorb the wine for about 10-15 minutes before peeling. Scoop them out of the wine with a slotted spoon, now it's time to eat them! Note: If you would like them alcohol free, then try the herb flavored suggestion below those are also wonderful and perfect for using in any stuffing recipe. 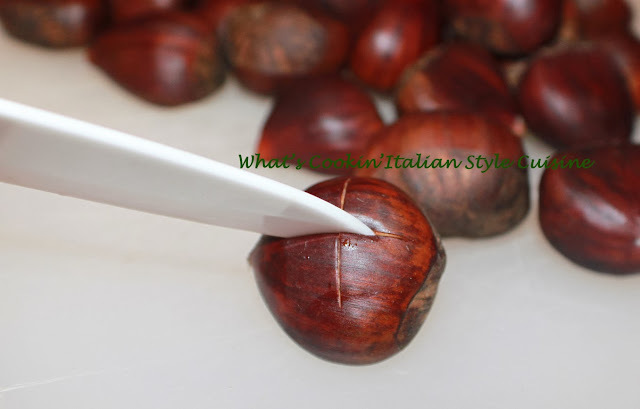 Optional for herb flavored chestnuts: immediately after roasting melt butter, add salt, pepper a little cayenne pepper, pinch of garlic powder and fresh sprigs of rosemary, toss to coat. Follow same cooking process below.